A previous awareness of what you are about to read never goes amiss. 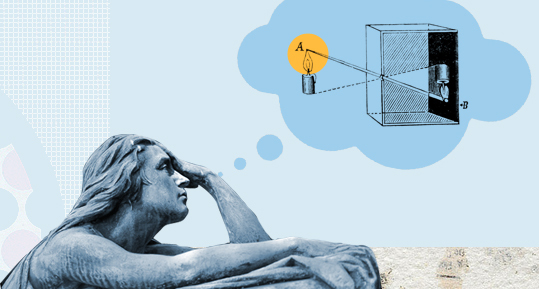 The philosophical warm-up begins with the knowledge that reflections on the world and its meaning follow a different logic to other types of reasoning. Another form of preparation is to ask yourself some specific questions about what you’re going to find, or else discuss the subject with someone else who may have read something about it. Playing at posing philosophical questions and their answers can be fun. Provided, of course, that you don’t forget the point of the exercise. You need to choose the right time and the right attitude. Those lonely nights are not necessarily a friend to philosophy (although Descartes might beg to disagree). You need a degree of lucidity which allows you to concentrate. You might also need -although not always- a good lamp, a pencil and a cup of coffee. You should also be fully aware that this is not the same type of fun as reading a comic, a novel or a news item. A love of theoretical reading has to do with the quest for precision, the logic of the texts, and the discovery of new information about reality. It is a good idea to go to the list of contents, as this —in most cases— will show you the path that has been followed, and that the author of the work is inviting you to travel. A helpful step when you have a philosophy text in your hands is to place it in its context. This can be done by asking yourself a series of questions, like when was it written? Who wrote it? Was the author part of a movement or was he involved in a particular debate? This context can be found by consulting a philosophy dictionary or a good encyclopedia. The summary usually found on the flyleaf or cover of many of these works is often very useful. On the matter of vocabulary, you should be forewarned. I say this because the style of expression can change enormously from one author to another. The history of the term matter has undergone major variations from Democritus to Hegel. Once again, philosophy dictionaries are a great help. Language is important too. The German used by Kant in 1754 is very different to the German used by Heidegger in 1935. We should always recall the Italian adage traduttore traditore and try and tackle the original text. And if this is not possible, remember some of the keywords used by the author that are untranslatable, such as the pre-Socratic arjé, the Thomist esse, Heidegger’s Dasein, the Weltanschauung of Dilthey, the impressions of Hume, the Cartesian cogito or the falsificationism of Popper. Reading over and over again in an attempt to memorize everything is difficult in a subject with a theoretical slant. It is better to take notes as you go. And if you’re lucky and the book is yours, you can write in the margins as a guide to your reading, or else underline some key paragraphs. Creating thought maps and linking the authors together with time lines is a good support. This type of diagrams are intended to show the relationships between concepts, authors or developments in the form of a chart. Although you may occasionally find something difficult to understand, it’s often a good idea simply to carry on. The insistence on a perfect understanding can in some cases cause you to become blocked, and is not recommended. Reading an impenetrable paragraph over and over again is liable to make your head spin and cause you to lose your reading pace. It’s better to press on even though not everything is completely clear, as an overall view may shed more light on the concepts. It’s also possible that the complication is not in you, but inherent in the text itself. You can then go back to some of the most complicated paragraphs. Not everything in philosophy can be understood, but that doesn’t mean that you can’t understand something about philosophy. The aim is to follow the path of the wise man who was aware of how little he knew.